"Professional, Personal, and Passionate... Fusion Dance pushes each dancer individually and as group to be the best at what they do from the VERY BEGINNING! No excuses. No wasted time. The choreography is fun, up-to-date and challenging, while the technique that is enforced is classical and demanding. Every student and teacher that participates in this workshop WILL become a better dancer, artist, and individual." 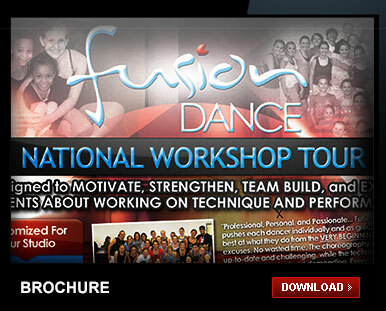 "I have attended the Fusion Dance Workshop for many years. It helped me improve on more than just my technique. The teachers helped me grow as a performer and fostered my passion for dance." "The Fusion Dance workshop was an awesome experience for our dancers. The Fusion staff was upbeat and got the dancers excited to learn! They didn't hesitate to give individual time and attention to each and every dancer - priceless!!! We can't WAIT to have Katie, Raymon, Kevin and Lillian back in 2011! " "Fusion was amazing. They were so inspiring and brought out the best in our dancers. We love bringing in professional teachers and choreographers that really know their stuff and Fusion is at the top of their game. Not only are the Fusion faculty great teachers, but they focus on the dancers as individuals and connect on a deeper level. You can tell dance is what they love and it showed from the moment they stepped into our studio until the moment they left. We will definitely be bringing them back to share their passion of dance with us again in the future. Fusion rocks!!!" Personalization of learning and technique are two of the main focuses of this intensive. Workshops are offered in one, two, and five-day formats for all levels of students.